As per team tradition, the Packers select game captains each week. Today’s captains will be G T.J. Lang (offense), DB Micah Hyde (defense) and WR Jeff Janis (special teams). As per team tradition, the Packers select game captains each week. Tonight’s captains will be G T.J. Lang (offense), LB Julius Peppers (defense) and S Chris Banjo (special teams). GREEN BAY — The Packers coaching staff awarded three game balls from the 27-24 victory over Miami on Sunday. On offense, the game ball went to right guard T.J. Lang, who recovered a third-down fumble by QB Aaron Rodgers on the game-winning drive, which kept the Packers alive for what turned out to be a fourth-down conversion from Rodgers to Jordy Nelson en route to the game-winning TD. On defense, rookie safety Ha Ha Clinton-Dix was the recipient. The press box statistics credited Clinton-Dix with a team-high seven tackles, all solo, including one for loss and one pass broken up. Mike McCarthy said on Monday he felt Clinton-Dix played his best game to date. On special teams, the game ball went to Micah Hyde, who had two punt returns totaling 41 yards. His 24-yard return in the second quarter came when he escaped a mass of humanity in the middle of the field, and his 17-yarder in the fourth quarter put the offense on the 40-yard line to start the final drive. Click here for more of Packers.com’s day-after-game coverage. The Packers might be fully healthy on the offensive line this week after all. 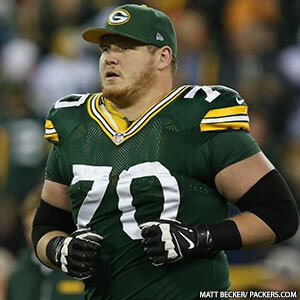 RG T.J. Lang, who missed the second half of Monday night’s game with a concussion, said he was medically cleared for non-contact work and returned to practice on Friday on a limited basis. He said he still had another test to take to get 100 percent clearance, so a final decision on his status would be coming over the weekend. He’s officially listed as questionable on the injury report. “I feel pretty good,” Lang said. “Each day this week I’ve slowly gotten a little better. I don’t know about my chances Sunday. If Lang can play on Sunday, the starting offensive line would remain intact. In his absence on Monday night, RT Don Barclay slid over to take Lang’s guard spot, and Marshall Newhouse came off the bench to play right tackle. Having the starting offensive line together should help backup QB Seneca Wallace, who will be making his first start in place of QB Aaron Rodgers. McCarthy officially ruled Rodgers out on the injury report Friday. “No disrespect to Aaron, and he knows this too … but you get to the point where it’s about your football team,” McCarthy said. “We’re trying to accomplish something special as a team. Now, special is winning on Sunday, because that’s all that really matters, and that’s what it’s all about. To McCarthy, the week hasn’t been about making drastic changes but rather proper adjustments.